Christmas carols in the U.S. and Britain | Notes from the U.K.
As Christmas approaches, carols leak into the folk (and occasionally other kinds of) songs at the pub’s singers night. It happens every year, and every year I ask myself if I shouldn’t take a week or two off to avoid them. I have a couple of reasons for that. The first and simplest is that I expect carols to be unchanging and over here they’re not. Some have the same words as the American ones and at first the tunes sound like they’ll behave, then they take a sharp left and head off in some new direction, leaving me all alone and on the wrong note. Usually at full volume. In others the tune stays the same but the words are different. Sending you light in the darkness and good wishes for whatever you celebrate. I might as well have said how shocked I was that gravity was operating over the holidays. Whoever it was would say, “Oh, I know. That’s the Cornish version.” Or the Boscastle version. Or the Padstow version. They’d learned a different version back in Shropshire, or Essex, or Truro, or Wherever. I’d explain: In the U.S., Christmas carols are harder to change that the Constitution, which (to simplify things a bit) only needs a two-thirds vote of the House and Senate and then the approval of three-quarters of the state legislatures. It’s a high standard to meet, but at least a procedure’s mapped out and ready to use. Christmas carols, though? Sorry, but we don’t have a way to change them, so they stay fixed, the North Star of our culture. Whoever I was talking to would hear me out and then tell me all over again about Shropshire or Essex or Wherever. Eventually I stopped trying. So that’s one reason I think about disappearing for the holidays. The next is that some of the carols are—well, let me tell you a story instead of trying to sum them up: Wild Thing and I went to a school Christmas concert to hear a friend’s daughter, and one of the carols was about Mary’s womb. And there we were expecting “Rudolph the Red-Nosed Reindeer.” Which, by the way, I hate. Wild Thing leaned over and whispered that the Methodists in Amarillo never talked about Mary’s lady parts, let put them to music. In Amarillo, it was all “O Little Town of Bethlehem” and “Glo-o-o-o-o-o-o-o-o-o(etc. )ria.” They sang the same carols I did, whose religion had, at least to my ears, been worn away by repetition. But change the words a bit and toss in Mary’s womb and you’ll jolt me out of my dozy acceptance. It starts to sound, you know, religious. I should add that the word womb doesn’t make for a particularly singable line. I grew up celebrating Christmas as a secular holiday. The extended family came to our apartment (and later, to our house) to eat, give the kids presents, and enjoy an argument or two, usually about politics. What can I tell you? Arguing was a form of entertainment in my family. But one year an older cousin’s girlfriend played the piano and we gathered around and sang carols, and every Jewish atheist one of us knew the songs as well as the few non-Jewish family members did. It’s a moment I remember fondly. It was decades before I stopped to think what deeply weird picture it makes. Minnesota, though, is packed with people who even if they’re not religiously Christian are at least culturally so, and that left less space for people who didn’t celebrate the holiday. Celebration stopped feeling voluntary, and I developed mixed feelings about it—part celebratory, part crabby. And in Cornwall? As far as I know, I’m the only Jew for miles around, and probably ditto for the only person whose family wasn’t, at some point, Christian. I still celebrate the holiday, which is good since Wild Thing never saw a holiday she didn’t want to be part of and has a strong historical claim to this one, but the more insistently it surrounds me the more footnotes, caveats, reservations I add. This year, the carols weren’t overwhelming at the pub, and the harmonies on a couple of them were stunning. My crabby meter registered only minimal grumpiness. Maybe repetition is starting to blunt the edges of the religion. Whatever you celebrate and whether it’s religious or secular, I wish you a good one of it. And if you don’ t have a holiday at this time of year, tuck my good wishes away and save them whenever your next holiday comes around. If you still remember by then where you left them. This entry was posted in Holidays and tagged a Jewish Christmas, American carols, Americans in Britain, Americans in England, atheism, British carols, Christmas, Christmas carols, Cornwall, religion, singing by Ellen Hawley. Bookmark the permalink. Happy Christmas to you and yours. Kris. With my dreidel I will play! I do remember that song. And in the spirit of pure cantankerousness, I hated it. I won’t try to justify that, I just did. But it did make me laugh to see it pop up in this context. Many thanks, and the same back at ya. I forgot to credit the photo. It’s Wild Thing’s, from last year–of the menorah I gave her for Christmas one year. Insane as that is, somehow it fits. Wait, what was my point? Oh, never mind. Point proved. We’ll move on. Follow your inner moonlight ! I like it even better now. This year, you’re missing the big battle over here between “Merry Christmas” and “Happy Holidays” – some say political correctness has gone too far. Other (like me) just ignore the debate and say Merry Christmas. I accept anything in response and I’ve graciously accepted “Happy…” Just about everything as people have shared their holiday wishes via their blogs and comments. I’m with Wild Thing, Methodist for years. We sang loud, off key and all four verses. Never heard the womb song until I landed in an Episcopal church. Perhaps a few more details than I needed. I’m guessing that Hanukkah is over (?). I hope it was happy. More than that, I wish you both a happy and healthy new year. Do they sing the same Old Lang Syne? 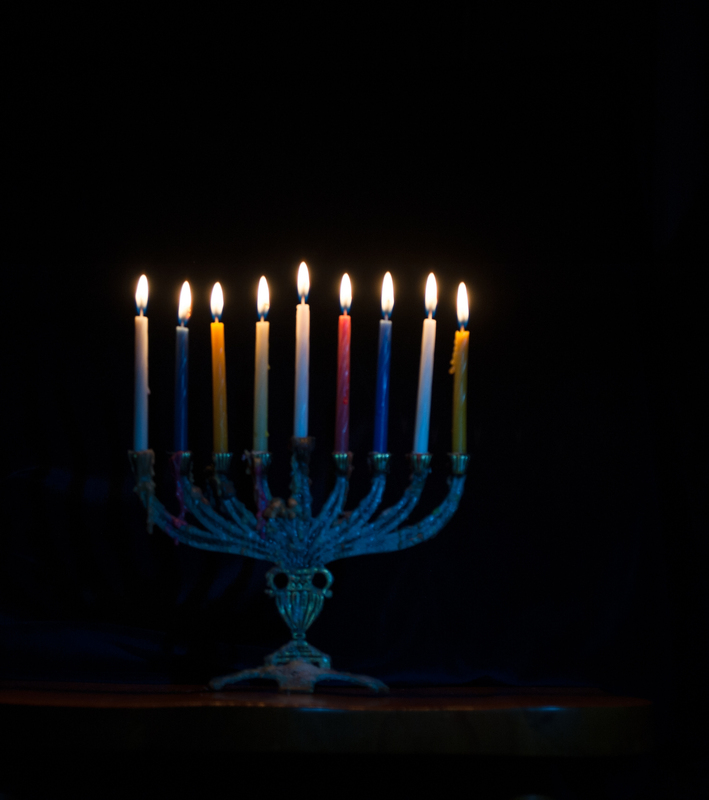 Hanukkah started on the 6th and ended when we ran out of candles, so yes, it’s over. When I say it started on the 6th, that probably means it started on the 7th but you light the first candles after sundown on the 6th, which is the 7th. Don’t ask or next thing you know we’ll end up discussing why Russia’s October Revolution took place in December. I read about the–was it a Congressman who got publicly grumpy about being wishes a happy holiday because it’s Christmas and nothing but. I deeply regret not being able to tweet him and wish him a happy holiday. As for anyone who thing saying “happy holiday” is about political correctness, they seem to be confusing political correctness with basic consideration of other people’s feelings, beliefs, and existence. So happy holidays and a merry Christmas to you. Keep singing loud and off key. It’s good for the soul, if there is such a thing. If there isn’t, then it’s good for something else. If it wasn’t started in Congress, I’m sure it’s been echoed by those running for PotUS. If I’m offering general wishes, I try to be inclusive. Mostly, I know what people celebrate and I act accordingly. I guess we can’t depend on common sense over here. We seem to need a law or a fence for everything. Have a happy! I forgot: I’m not sure about Auld Lang Syne. We don’t tend to go out on New Year’s Eve. But you spell it correctly – I had no idea. It’s not a very useful talent, but we all use what we have…. “Harold Cohen found under the Christmas tree the Menorah he had so long wished for”. Happy holidays from Cornwall’s other Jewish atheist. Love from Jane PS, my brother Martin insisted that a Christmas tree is an upside down Menorah or possibly vice versa. Two religions, one iconography. It’s good there are two of us. It’s taken me a while to get the tree and the menorah images turned upside down in my head but, yes, I think I see your brother’s point. Your wishes are tucked in the pocket…over my heart. Happy Day to you! I laughed out loud at the idea of a church in Amarillo singing about Mary’s lady parts! Love it! I wish I could reconstruct the whole verse but it shocked itself right out of my head. I’ll have to ask around. Surely someone knows it. Wild Thing is exactly right about the hymns in Amarillo. Ask if she knows where Dumas and Floydada are. I grew up in her neck of the woods, went to Amarillo College for a year and to West Texas State in Canyon for another year before we moved to North Dakota. Good places. Even better at a distance. Wild Thing says, “The further the better.” And “My god, yes, Floydada.” She had to correct my pronunciation, though. That’s so funny about your reaction to the familiar carols set to unfamiliar tunes. I worked in a school where we went to the local cathedral for Christmas assembly. I’m an atheist but I felt confident that I had passing familiarity with the carols that were to be sung. Then the organ cranked up and this tune emerged that was not only dissonant and somewhat monotone but was also not what I anticipated. Turns out the school used the medieval tunes. I stood in silence, bewildered, my atheism even more glaringly obvious than usual. And somehow all that medieval tunesmithing, it’s connotations of serfs and plague, killed any festive atmosphere there might otherwise have been. I grew up in a non-church going, non-denominational household where we were encouraged to choose our own faith. I chose atheism. My husband is also an atheist but raised by active Christians. We, therefore, celebrate secular Christmas with our kids but where we differ is my husband loves traditional Christmas music whereas I detest it. The boys from King’s College choir are like rusty nails on my eardrums but they fill my husband with Christmas spirit. I much prefer Nat King Cole or ‘Fairytale of New York’. Happy holidays to you and Wild Thing and best wishes for 2016! Ah, yes, serfdom and plague: the spirit of Christmas. That’d put you off traditional Christmas tunes. Wishing you the best for 2016 as well. Serfdom and plague. Amazing how some things never change! did anyone lately wish you a Happy Hanukkah? Happy Hanukkah. Happy Christmas. Happy Holidays. Happy New Year! Oddly enough, someone did just today. But it can’t hurt to be wished all those holidays at once. And good ones to you as well. It’s a weird kind of segregation to have a village/county version of the same carol. Or maybe more of a secret password. Sort of like when I was a kid and went with a friend to some other milquetoast Christian church that said “trespasses” in The Lord’s Prayer instead of “debts.” Totally threw me. Ritual can only be ritual when left alone. I heard myself asking someone, “Are you braced for Christmas?” I expected a laugh. Instead I got the standard yes and I’m sure she walked away thinking it was some strange American tradition to ask it that way. It’s a funny thing how repetition makes something into a tradition and at a certain point any change threatens the structure of our thinking. I don’t know quite what to make of it, but it does seem to be true. As you know from my blog, we (actually, it’s me) “do” Christmas. It’s definitely secular and we tend to be catholic (in the universal sense of the word). We’ve had Jews, Hindus and atheists at our Christmas table because, for some reason it seems to be a holiday that makes people feel left out if they’re not part of something. I like it because I like doing some of the bits around it – the cooking, decorating, etc. even though it makes me tetchy sometimes. And we use it as an excuse to see people we don’t often see (or not, as the case may be). As for carols: having grown up in a Presbyterian home and going to a school that had an annual carol service, I still love singing them. When we lived in Cape Town we would go to the annual Carols by Candlelight at Kirstenbosch and sing along lustily, lubricated by a glass or two of wine. This year, there was a Carols by Candlelight in the village. We elected not to go: it was starting at 6pm and would probably be over in an hour and a half. It doesn’t get dark at the moment, until 8pm. Candlelight? Seriously? And it was to be a concert by an a Capella choir. Where would be the sing-along? We elected to go to a different Carol’s – the local pub. As it turns out, we were right. Someone who had gone to the concert came in after to have a drink and said that the sing-along was a serious afterthought. Humph! Anyhow, whatever you’ve been celebrating – Channuka and/or Christmas – I hope it was good and I wish all good things to you and Wild Thing for 2016. Many thanks, Fiona. I love your tradition of gathering in people who might not otherwise celebrate the holiday. Back in Minneapolis, at Thanksgiving we invited friends who didn’t have family in town, or who were estranged from their family, and that became an essential part of the holiday for us. We were in both categories–I didn’t have family in town and Wild Thing was estranged from hers. Here we’ve often been gathered in by friends at Christmas, and that’s been wonderful. This year we were on our own and, as it turned out, that was also very nice. There are many ways to celebrate. But carols that you can’t sing along to? Bah, humbug. Thank you, and agreed, there are many ways to celebrate. My doing this goes back to when I was a young woman and people took me into their homes. My way of reciprocating. And actually, your situations echo ours in someways. I’m estranged from my only sister and the rest of the family are far, far away. The Husband doesn’t see eye to eye with his sister and his children… well… that’s another story…. So we do our own thing, preferably at home, and with people we choose. Bah, humbug! Couldn’t have said it better, myself! I read this, hit Like, and went to walk the dog, but it’s stayed with me that this is your way of reciprocating the welcome you got when you were younger. I love that. Thank you. It’s taken a while to realise that that’s what I’ve been doing all these years. Slow learner, I guess. Hope it was a good walk. Not cold, I gather. Spoke with The Son-from-another-Mother’s real mother yesterday, in the Wirral. She says it’s far from cold. Be well! Not at all cold–in the fifties, I’d guess (I still think in Fahrenheit)–but very, very windy. Thanks, Eduardo, y feliz ano nuevo–without the diacritical mark on the N because I have no idea how to do that on my English-only keyboard. Happy Holidays from one Christmas Carol singing Jew who grew up celebrating Christmas with atheists to another(sort of.) We have a Wild Thing & Cody ornament on our tree. Surprisingly, we had candles to last throughout Chanukkah but we had to do the last 3 days with only one Menorah. We had done the first 5 with two but we had to ration the candles to make it all eight days. …and a happy et cetra.